– I Douglas Ralph , Minister. 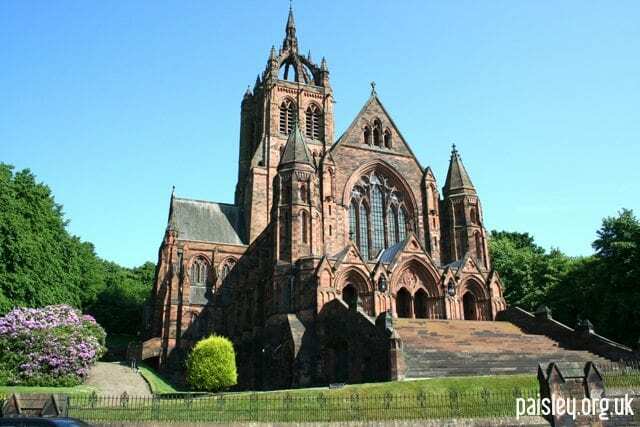 The erection of the church was commissioned by the family of Thomas Coats of Ferguslie (1809 – 1883) in memory of their father, who, as well as being one of the founders of the worlds famous J & P Coats (thread makers) was a regular worshipper with his wife and family of five sons and five daughters in Storie Street Baptist Church (demolished 1912). The opening service was held 13 May 1894, nine years after the building of the church had begun. The building is gothic in design – the architect being Hippolyte Blanc of Edinburgh, whose memorial can be seen on the east wall just before entering the east transept – simply his name and the date 1894. The ground plan is in the shape of a cross, 165ft. long and 100ft. broad and seats 1000 people. The crown tower and spire rise to a height of 240 ft. above sea level, forming an outstanding feature of the Paisley sky-line. About 350,000 pieces of coloured marble make up the mosaic floor. The central panel depicts the lamb with halo and carrying a banner. On either side are the traditional emblems of the four evangelists : The man representing St.Matthew : The Lion – St.Mark: The Ox – St.Luke: The Eagle – St.John. Immediately above the staircase leading to the halls below, can be seen the gilded monograms of the sons and daughters of Thomas Coats. You can read more on our Paisley Visitor Attractions page.